Back home where it belongs! I came home from work yesterday to see a white USPS Priority Mail box waiting for me. I did not need the powers of the Amazing Kreskin or even Superman's X-Ray vision to know what was inside. My K2 was back! Hot dog! My initial inclination, of course, was to rip the box open and run the rig downstairs to the shack and start pounding brass. But first things, first! First there was track practice for my son, homework for both my kids, bath time and bed time. Then and only then did I take the K2 and put it back in its rightful place on the operating table. To my delight, I found out that Alan W3DVX did an outstanding job putting the final touches on my K2. The frequency is spot on! Twirl the dial on 30 Meters to 10.000.00 MHz and WWV is there, right where it should be! Next was a check of the K2's internal crystal filters. I went to 40 Meters and picked out a station that was in a cluster of several close by signals. Changing the filters was a thing of beauty. The station I had picked stayed put, rock solid and the interfering stations magically disappeared as I flipped through the K2's filters. The KAF2 is now installed and I reset the internal clock to UTC. The audio filter sounds fabulous and I can already see where it will be a big help in the QRP sprints; when everybody and his brother seems to obstinately occupy about 5 kHz of spectrum instead of spreading out! And as if things couldn't get better, I started calling CQ down around 7.031.00 MHz and I was answered by TK5JO, Guy in Corsica. A new one for me! I've never worked Corsica before, either QRP or QRO. This becomes my 69th DX station worked as I continue on towards QRP DXCC. Oh baby, what a night! As I predicted, an already fabulous rig is now even better since it has been professionally tweaked and aligned by someone who knows EXACTLY what they are doing! And with this result, I can recommend Alan Wilcox, W3DVX and his firm Wilcox Engineering enthusiastically and whole heartedly! I got on 40 Meters on the K1 tonight and seemed to have a pipe line into North Carolina. The pipe line was very productive and yielded two very nice QSOs. The first was with Jim KB2JWD who lives in Waxhaw. Waxhaw is near the South Carolina border, not too far away from Charlotte. I've worked Jim before in the Adventure Radio Society's Spartan Sprint; but this was the first opportunity I've ever had to chew the rag with Jim for a bit. Jim was running his NorCal SST rig at 1 Watt out to a G5RV. He was an honest to goodness 579 into New Jersey. That 'lil NorCal rig was doing a great job squeezing out RF into the aether. Unfortunately, Jim had to QRT and couldn't stay on too long. 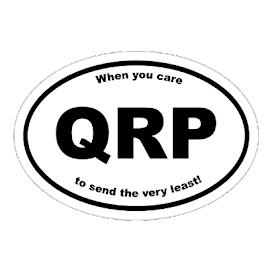 But for as long as it lasted, QRP to QRP QSOs always seem extra special. The next QSO was with W4/VU2YK. Wouldn't you know that the first VU station that I've ever heard, let alone worked, would be portable in Raleigh, NC ???? Rahul has been in the USA for the last three months, visiting his son who works and lives in Raleigh. He's going to be here for another month, and then will be heading for New Delhi, which is his home QTH. Rahul was using an Icom IC-706 at 100 Watts to a dipole that was only 15 feet up above the ground. The dipole may not have been high; but Rahul had a killer signal! If the K1 had an analog meter, the needle would have been pegged. We talked for a bit and then the band started going even longer and both our signals were getting weaker. We exchanged the normal "end of QSO" pleasantries and we both QRTed for the night. A relaxing night on the radio is better than just about anything! #68 is in the books! Just because the K2 is away at the doctor's getting some TLC, doesn't mean that Amateur Radio has to stop! In the meantime, my able bodied K1 has switched from its role as my primary portable rig to a new status as main shack rig. As much as I love my K2, the K1 has always been my sentimental favorite as I built it before the K2. It's a great little radio; but its size in no way limits its capabilities. The receiver is superb and the transmitter is every bit as rock solid as the K2. Really, its only limitations are the bands that I can go on. I constructed my K1 as a 4 band version, employing 40, 30, 20 and 15 Meters. Since Foxhunting season is over; I'm now back into a nightly routine of looking for a nice ragchew. Tuesday night, however, I had the bug to go to the really bottom end of 40 Meters to see if there was any DX to be had. A little tuning around got me locked onto a new one! On 7.005 MHz, I heard HH4/K4QD calling CQ. Now Haiti is not the rarest DX in the world; but it is kind of rare. Its a very impoverished and strife torn nation and is not noted for too much Ham radio activity. My ears perked right up when I heard Jan. He was clipping along at about a 23 WPM pace, working split and listening for calls 1 kHz up. I twirled the VFO up to where I thought he'd be listening and used my RIT control to get back to the frequency he was transmitting on. Three or four calls and I was in the log. Jan was a strong 599 and he gave my 5 Watt signal a 579. Haiti is my 68th DXCC entity worked since I went 100% QRP in 2004. 68 countries worked on the bottom end of the sunspot cycle. Not too shabby! A few minutes later, I heard and worked Ego, 9A2SY in Makarska, Croatia. Croatia is not a new one for me; but I still get a thrill of having my 5 Watt signal heard 'round the world. 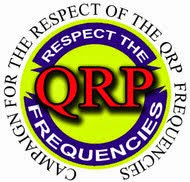 QRP is a real kick - QRP DX is even better! As mentioned previously, Alan W3DVX of Wilcox Engineering, has my K2 at the moment. I heard from him the other day. He's got the frequency readout and the filters aligned. He fixed my BFO problem where I was hearing both sidebands of a signal. He's at the point of installing the KAF2 and has run into a problem. When the KAF2 is installed, it messes up the operation of the KAT2 auto tuner that I built and installed last year. I should have my K2 back this week, hopefully, all professionally tweaked, aligned and ready to go! Say It Ain't So, ARRL !!! This was posted to QRP-L yesterday by Alex KR1ST. Alex is a very level headed guy; and I have no qualms with accepting this as the truth. The changes they now propose will in effect allow (automated and non-automated) RTTY and data transmissions up to 3kHz wide in those portions of the HF band you now traditionally find only CW. If you read the appendix carefully and compare that to their original proposal you can see that they have dropped bandwidth segment divisions for all but the ten meter band. If you thought that CW operations were relatively safe under the original regulation by bandwidth proposal because the proposed bandwidths were so narrow in your segment of interest to be useful for high speed data, well, it is not anymore. The new proposal allows for RTTY and data up to 3 kHz wide to be transmitted all the way down to where you now traditionally only find CW transmissions. One may wonder why the membership is not informed of this meeting and the dramatic changes in the petition. This new proposal is not only harmful to (QRP) CW operations but also to operations outside the USA and its territories. As you can see from their meeting record, the ARRL argues that a revision of the petition was necessary because of recent rule changes. One of the big rule changes is of course the dropping of the Morse Code proficiency test. Perhaps the ARRL expects CW to eventually disappear and has already begun the refarming of the CW portions of the HF bands. You probably noticed the recent request on the ARRL web site for expertise on HF Digital Communications. and you can contact the ARRL through the usual channels. Write your Division Director and leave comments with the FCC today! Time for a callsign change! HF privileges, which is what I always had wanted. I was also getting my share of DX as well as ragchews. Life was pretty good. However, in the radio club that I belonged to, there was another DOH. Phil Styn WB2DOH was the other DOH And people used to get the two DOHs confused. So in 1983, two momentous things happened. First, I set paperwork in motion with the FCC to request another callsign. It was granted and I became N2ELW in the Spring of that year. That was the callsign that I was to live with for the next 17 years. The second thing that happened that year was that I started on the road to upgrading my license class once again. This time my sights were fixed on to acquiring an Advanced Class Amateur Radio license. I commenced studying in the mid-summer and was finally feeling fairly confident by October. Confident enough to make a trek to the FCC and take the exam. Taking a license examination in those days was light years different than it is today. First off, there were no question pools. You picked up a copy of the license manual for whatever class license you were interested in, and you married it. You and the book became inseparable companions. You and the book became one. You not only studied the theory; but you learned it. You had no idea as to what kind of questions they were going to throw at you; so you learned everything the best you could. Sure, everybody memorized formulas and stuff like that; but you had no questions to pick from - you were going into the exam cold as an ice cube. Secondly, if you wanted to upgrade; then that meant a visit to the FCC offices. For those of us in New Jersey, that meant either a trip into New York City on Varick Street, or a trip out to Langhorne, PA. I chose the Langhorne, PA location. It was an easy drive and the Oxford Valley Mall was located right next door. There were plenty of places there to go grab a snack, afterwards. Unlike today, there were no friendly "Joe Hams" there to greet you. You were met by FCC personnel who usually acted like you were the last person they were interested in seeing. The usual demeanor of the day was brusque and "no nonsense" of any kind. But, on the up side, the FCC folks were extremely professional, competent and fair. We lined up like cattle waiting for the slaughter. Code exams were given first. For the heck of it, I decided to give the 20 WPM code test a try. I had my 20 WPM certification from ARRL Qualifying Runs for a while by then, and I figured it would be a cakewalk. WRONG! For whatever reason, I choked like a Little Leaguer on a baseball bat. I failed miserably - making the "newbie" mistake. I missed some characters and instead about forgetting them and moving on; my brain became a log jam and my copy ended up looking like gibberish. Kind of like "white coat" high blood pressure, I guess. Some folk's blood pressure goes up at the Doctor's office just because they know it's going to be taken and they get all worked up about it. Later on, I realized that it was a case of the pressure of the moment of being in the Hallowed Halls of the FCC. Once I was out of there, I was able to copy at 20 WPM with no problem. Good thing I wasn't testing for the Extra exam that day! But it was not a good way to start; especially on the day that I was taking the hardest examination of all the FCC offered for Amateur Radio exams. Years later, upon earning my Extra, I was to confirm what many others had told me. The Advanced Class Amateur Radio exam was THE toughest of all the tests. The theory and the math were difficult; and I still had to know frequency allocations as well. All in all, it was not a pleasant experience; but I did in fact make the grade. It was October 18th, 1983 and I walked out of the FCC offices as N2ELW, Advanced Class Amateur Radio operator. New frequency privileges in my pocket and a burnin' yearnin' desire to make use of them. In the months that preceded my upgrade to General, I scrimped and saved my money for a new rig. The Drake 2-NT and Heathkit receiver were good; but General class Hams use SSB ..... right? Once I had upgraded to General, I was headed for the Promised Land, the land of milk and honey ..... 20 Meter phone! As much as I liked CW, I still had the visions of Ham Radio in my head that I had since I was a kid. Being a General meant sitting at the desk with my feet up and chair tipped back. There would be a microphone in my hand and I would be talking to all the rarest places on planet Earth! I would become close friends with people around the globe. A bit naive, yes, but old visions die hard. I managed to save up some cash and bought myself a used set of Kenwood T-599 and R-599 Twins. I bought them from John Kakstys W2FNT who was for years an icon in the used Amateur Radio equipment market in New Jersey. A trip to John's basement was like Christmas, the 4th of July and Disneyland all rolled up into one - especially for a newer Ham! After the license upgrade, the Kenwood Twins were installed into the place of honor on the operating desk. An Astatic D-104 all bright, and shiny chrome was to be the method of sending my voice into the aether. I turned them on, tuned everything up and proceeded to cautiously call CQ on the 20 Meter phone band. And that is precisely when all hell broke loose! Unbeknownst to me, my family was downstairs trying to watch TV when I undertook my SSB maiden voyage. Much to their dismay, as well as mine, my voice made 5X9 into the TV! Walter Cronkite sounded like a weird Frankenstein Donald Duck thanks to yours truly! The picture took on a herringbone pattern unlike anything I had ever seen before! This had all NEVER happened in all those months of pounding brass! TVI had never raised its ugly head until that day. Still being a relatively new Ham, with no Elmer (mentor) to speak of, I was blissfully unaware of the proper RF grounding techniques that would be needed to successfully carry on a SSB career. Some further delving into the ARRL Handbook as well as other ARRL publications gave me quite the education. However, working out of a second story shack made things all that much more difficult in obtaining the proper RF ground. Counterpoises of the proper length helped; but did not solve the problem completely. I was gloomily staring at self imposed quiet hours as there was no way the family was going to let my hobby interfere with their TV viewing. That's when it struck me! All I had to do was hook up the key and I could operate anytime I pleased! The plan was formed ...... CW during Prime Time and SSB during the off hours. But a funny thing happened on the way to the Hamfest. I took a liking to CW even more than I had before!. I ended up using it all the time after a bit of experimentation revealed that I was getting much more of a "bang for the buck" using CW. I quickly got disenchanted with SSB as my meager antenna set up wouldn't allow me to get out much. It became quite plain to me that CW was getting me scads of DX that I was never able to get with SSB. And CW was keeping my family from turning into a lynch mob out to get ME! So it was quite by accident that I became the avid CW op that I am today. But it was a happy accident; and I'm glad that it happened. I've had the best time I could ever hope to have using Morse Code, simple wire antennas and QRP. I wouldn't change it for anything. One of the first things that I did after making my first few QSOs as a Novice was to purchase an ARRL General Class License manual. Even though the Novice license had become a renewable license class; I decided that I would pretend that is was "old school" and that I would upgrade within a year. Many QSOs and listening to W1AW got me up to 13 WPM rather quickly. I buried my nose in the license manual for what seemed like months. Finally in either June or July, it was announced that the FCC was going to be appearing at a Hamfest up in Morristown, NJ to administer exams. Wow! That was not a common, everyday occurrence. The rule of the day was that you had to appear before the FCC at their offices. This was truly the exception to the rule. The day for the Hamfest came. I remember that it was ultra hot, humid and sticky; and I was as sick as a dog! I had some kind of summer cold; and as hot as it was, I was shivering. I must have been running one heck of a fever. My sister was kind enough to drive me up to the Hamfest and wait for me while I tested. I wasn't feeling well enough to drive myself. I remember going in there and putting on those antiquated headphones to take the Morse Code portion of the exam. I remember that they started with the higher speed 20 WPM exam and work their way down. This was good; because after listening to the code at 20 WPM, 13 WPM actually seemed slow! This was still at the point where you copied a QSO and they checked your copy for at least one minute of solid copy. I must have done all right; because the next thing that I remember was someone shoving a copy of the written exam to me along with a sheet on which to mark my answers. I answered the questions the best I could and then this grumpy older lady who worked for th FCC was shoving a white cardboard slip into my hands which informed me that I has to sign as KA2DOH/AG until the permanent version of my license came through the mail. I was happy, I was proud; and I was feeling miserable. If I didn't want to stay for the rest of the Hamfest, I must have been doing pretty badly. I remember crawling into my sister's car so that she could drive me home. I didn't even get on the air when I got home. All I remember at that point was crawling into bed and falling asleep so fast that it was like I had passed out. The next thing to happen over the next few days changed my Ham radio life forever. I was first licensed in December of 1978. This was a few years after my first, unsuccessful foray into Amateur Radio. I tried to earn my license as a high school student; but as it turned out, I did not have enough determination to learn the Morse Code. I got frustrated and gave up way too easily. After college and winning my "first" full time job, I read in the local newspaper about an Amateur Radio Novice Class license course that was being offered at a neighboring town's high school night program. I took the plunge and jumped in with both feet. Eight to ten weeks later, in November of 1978 I passed the test. I even aced the Morse Code part! Four weeks later, in December, I received my license with the callsign KA2DOH. As a Christmas gift that year, my parents bought me a used Drake 2-NT transmitter from Burghardt's in North Dakota. I has saved for and had purchased a Heathkit HR-1680 receiver that was specifically oriented towards the beginning Novice operator. I took most of January to build that radio. Finally on January 28th, 1979 I was ready! The antenna was a random length wire stretched between my bedroom window and the garage. This went to an antenna tuner which went to the 2-NT. I don't quite remember how I rigged the station to switch the antenna between the transmitter and receiver; but I do vaguely remember there being a manual throw knife switch in there! My dummy load was a Heathkit Cantenna. The key was a Viking Master straight key. I had a Globe VFO hooked up to the Drake 2-NT through its crystal socket. I carefully tuned the transmitter and the antenna tuner and listened for a station calling CQ. I was too nervous to put out my own. I finally heard someone calling at a comfortable speed. The frequency was 21.135 MHz on the 15 Meter band. I put out the station's call followed by "de KA2DOH" and was answered by Adam KA9CIH out of Armington, Illinois! This milestone QSO lasted all of about 20 minutes, from 2110 - 2130 UTC. I gave him a 589 and he gave me a 599. I don't remember too, too much about the QSO except that I was terrified, ecstatic, sweaty-palmed and elated all at the same time! And at the end I was walking on air because finally, I was a "real Ham"! I was also exhausted! I didn't make any more QSOs that day. I didn't even call CQ any more that day; as I even logged unsuccessful CQs in my logbook. 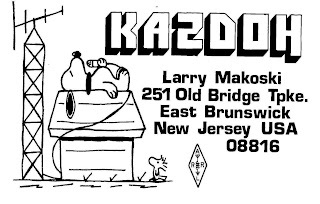 My second QSO came a few days later when I answered a CQ put out by KA3CIV, Gary in Saxonburg, PA. And so it went, day after day after day. My code speed increased; and by the summer of that year, I was ready to go for my General. That's a whole story in its own right that I will go into in another post. For kicks, I've dug out my old Novice logbook and have entered into QRZ, some of those first stations that I had worked. Sadly, some of these folks are either Silent Keys or have dropped out of Amateur Radio altogether. Happily, some others are still active and have upgraded and sport different class callsigns. The image above is my Novice QSL card. 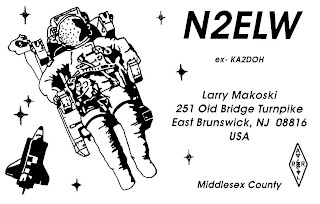 I did the artwork myself and had them printed by a QSL printer who no longer exists. Those Novice days were good days! I'm glad that I entered the Ham radio arena the way I did. I think the FCC made a terrible mistake when they discontinued the Novice license. It was certainly an experience that I will NEVER forget. The results came in for Monday night's Spartan Sprint. Out of 78 entrants, I came in 17th in scoring, if you look at it solely based on the numbers of QSOs generated. Not bad; but again not great. There's another method of scoring, which is based on the number of QSOs generated that is tied in to the weight of your station. In that category, I came in 21st, which shows I need to get cracking and finish the ATS-3 !!!! The first method, though, is scoring as per any other QRP Sprint. And like I said before, I did okay - just okay. Such is the curse of living on a typical 100' X 50' NorthEast suburban lot. My G5RV is layed out more like a shallow horizontal Vee rather than a straight line dipole. And since the maple in the back yard had to be topped; I lost about 15 feet worth of height for the apex of the antenna. My Butternut HF9V is okay; but typically for a vertical, it's noisier than the doublet. Add to this the fact that I desperately need to re-do the radial system this Spring or Summer. I sure could use a few higher trees in the backyard! I know that the G5RV would certainly play better if I could manage to get it up higher. But right now, 25 feet is all she wrote. My darling wife is adamant about no towers; and besides, I can't afford one anyway. So I guess I have to face it and work with what I have. It's human nature, I guess, to always want more. I should be happy with what I have. I live in a community with no HOA's or any kind of deed restrictions. I COULD have a tower if I really desperately wanted it enough. I am not forced to live with indoor attic antennas. I need to learn to be satisfied with; and be grateful for what I have. Tonight was the 2007 Pesky Texan Armadillo Chase sponsored by those "Pesky Texans" of the NeTxQRP Club. This is always a fun event. This year there were only 12 'dillos to chase around; and I managed to snag 7 of the armored critters. KT5V, W5MJ, W5TA, N5ET, N5DO, K5OT and KG5U. Normally I have a radio pipeline into Texas and Lone Star QRPers are generally easy to copy. Not tonight! It was a real struggle on 40 Meters as there was no shortage of static crashes and deep QSB. There were a lot of requests for repeats of information; and several times I had to really listen carefully to make out the callsign of the Armadillo who was calling CQ. Even with the cruddy band conditions, it was still fun. Meanwhile, it's 11 degrees outside and I'm freezing! My antennas, I mean. Last night, the wind was so hard and so loud that it woke me from a sound sleep. I think I have a feeling that I now know about the kind of wind the Apostles heard on the first Pentecost! As I lay there, listening to the house rattle and creak and marveling at the sound of the rushing winds, one of my third or fourth thoughts went to my G5RV and Butternut vertical. In the grogginess of the moment, I was sure that I was going to wake up in a few hours to find antenna and mast bits and pieces laying on the ground. I certainly hope the winds die down today. Not just for the sake of the antennas; but because the wind chills are exceptionally brutal. When I dropped my kids off at school this morning, my face felt like it was going to crack as I walked them from the car to the school building. I hate it when it's so cold that my face aches. To think that just a couple days ago it felt like May outside. Now it feels like we were dropped somewhere on an Arctic ice shelf. Fortunately, I was able to stay warm inside and operate the Adventure Radio Society's annual monthly Spartan Sprint. And it was a very good time, too. The band conditions were pretty darn good. I made 41 QSOs in the two hours which is pretty good by my standards. 40 Meters was long and I was able to work the following states - GA, IL, FL, WA, MN, TX, LA, CO, NC, MO, MS, ID and even a NJ station of ground wave! 80 Meters yielded the closer in states - VA. PA, NY, NH, ME, MD, MI, ON, and some farther ones too ... FL, and WI, AL and TN. QRN on 80 Meters was quieter tonight. I guess the cold outbreak quelled any thunderstorm activity on the Eastern half of the country; so we were kind of back to winter band conditions for the evening. Hopefully it will hold for tomorrow night's 80 Meter Foxhunt. This morning, we received over 2 inches of rain. Right now, I'm sitting here during my (late) lunch break; and it's sunny and 55 degrees. I hope this is a harbinger of thing to come! If this keep up; it will be time to start packing the K1 in the car for portable operations from the car during lunch time again! 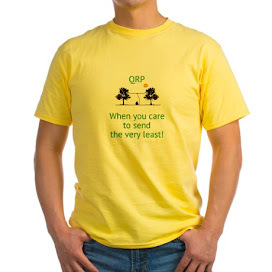 It will be nice to get out in the sunshine and fresh air, fire up the radio and make some QRP CW contacts. In the meantime, I have decided to send my K2 to a professional to get some work done on it. Right now, it is performing superbly; but I want it to be professionally "tweaked" and aligned. I haven't the time to do it myself. I'll be sending it out after the last 80 Meter Foxhunt. I feel bad about not doing it myself; but between work, K of C commitments, taking care of my children when Mom's not home (working), taking the kids to their various activities (cheer, gymnastics, etc.) - it's just a bit too much to think about. 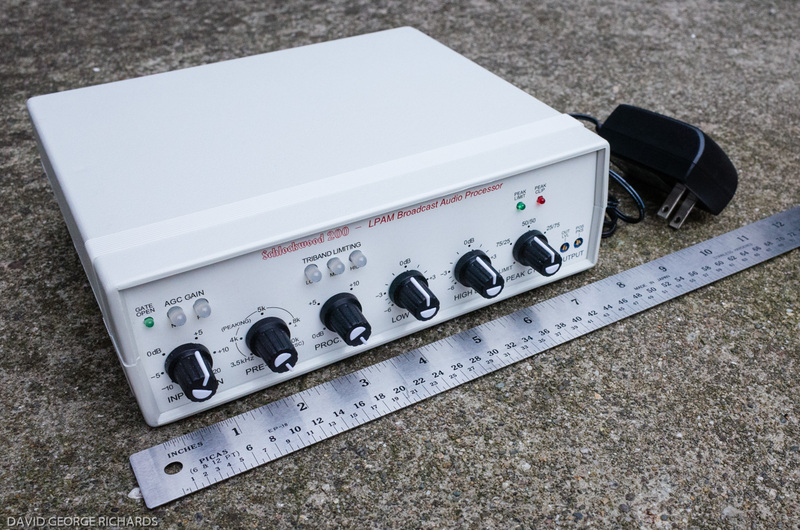 I've been in touch with one of the Elecraft builders about it; and have found out that his rates are super reasonable. My K2 is great now; and I expect it to be even better when it comes back.